Some of the earliest bakeries to serve tomato pie in Philadelphia were still open in the twenty-first century. Sarcone’s Bakery, shown in this 1954 photograph, was founded in 1918 by Italian immigrant Luigi Sarcone. Since then, the bakery has operated from the same location on South Ninth Street and become a neighborhood landmark. Five generations of the Sarcone family have served tomato pies from the original 1918 brick oven to eager diners. Several other early twentieth-century Italian bakers, including Iannelli’s and Tacconelli’s, also remained in business in the twenty-first century and prided themselves on their long histories and their tomato pie recipes. Tomato pie was brought to Philadelphia by Southern Italian immigrants in the early twentieth century. The crust is based on a focaccia-like dough popular in the city of Palermo, Sicily, shown here in 1910. 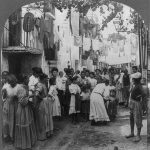 During the late nineteenth and early twentieth centuries, Italian immigration into Philadelphia exploded, due in part to instability caused by the unification of Italy in 1870. Philadelphia soon had the second-largest Little Italy in the United States, surpassed only by New York. With Italian immigrants came Italian restaurants serving variations on the foods of their homeland. 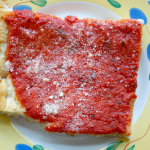 Philadelphia-style tomato pie, while based on the Sicilian sfincione palermitano, has become a distinct product over the decades, omitting traditional toppings like anchovies in favor of a heavily spiced tomato gravy and a sprinkle of Parmesan or Romano cheese. Served by Italian bakeries in South Philadelphia since the early twentieth century, the tomato pie became known by many names: church pie, square pizza, red pizza, granny pizza, and red pie. 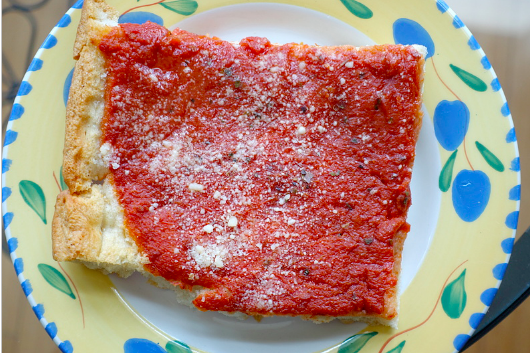 Although made in a rectangular or square shape similar to Sicilian-style pizza, tomato pie within the city and surrounding region remained distinct from contemporary pizza because of its thicker, spongier texture more akin to a focaccia-like bread from Palermo, Sicily, called sfincione palermitano. In an era of high immigration from southern Italy, tomato pie became a Philadelphia staple at establishments such as Iannelli’s Bakery (established in 1910), Sarcone’s Bakery (1918), and Tacconelli’s (early 1920s). It continued as an offering of mid-century bakeries such as Gaeta’s (originally Scalea’s) Italian Bakery (1941) and Cacia’s Bakery (1953) and later twentieth-century shops including Marchiano’s Bakery (1984) and the Baker Street Bread Co (1992). While the tomato pies of many Philadelphia bakeries retained the shape and sponginess of the sfincione, gastronomical similarities to the Sicilian recipes ended there. Unlike the Palermo-style recipe, with onions, anchovies, and caciocavallo cheese, in Philadelphia tomato sauce or gravy became the essential ingredient. Over the decades of the twentieth century, many Italian bakeries focused their energies on creating their own blend of tomato gravy with varying amounts of herbs and seasonings. Dough preparation varied as well. Many aged the dough before baking, and others used bread dough or dough similar to zeppole pastry or American stromboli. According to some oral traditions, tomato pies were a profitable way to use leftover dough from baking rolls for hoagies. However, Philadelphia bakeries in the early decades of the twenty-first century made their tomato pies from scratch each morning. Like its Sicilian counterpart, tomato pie is baked in a pan and at low heat, traditionally in a brick oven. After baking, the pie is usually dusted with a very light sprinkling of Parmesan or Romano cheese (never mozzarella), cut into square pieces, and can be served hot or more typically cooled to room temperature. Variations on the tomato pie could be found in the region as foodways expanded and intersected. Perhaps the greatest regional rival to the Philadelphia tomato pie developed in Trenton, New Jersey, where the recipe typically used more cheese and toppings (think of it as a pizza in reverse) with less-sweet dough and generally the circular shape associated with Neapolitan pizza. Both types of pies have been made in Philadelphia and the surrounding region, while Philadelphia-style tomato pies also spread into New Jersey. In addition, Tony Roni’s Pizza franchise offered a tomato pie based on a recipe traditionally from the Abruzzo region of Italy. Tomato pies also can be found by other names throughout the United States. In Brooklyn, they became known as grandma pizza, but were not served regularly in New York City pizzerias until the 1990s. Farther north, the tomato pie of Utica, New York, resembled the Philadelphia-style pie in taste and texture. The tomato pie of Philadelphia developed into a regional delicacy in no small part through the continued existence of its neighborhood Italian bakeries and the popularity of their pies. Although many of the pie-makers from the early- and mid-twentieth century closed or focused their expertise on pastry and cake production, tomato pies became a part of Philadelphian food culture no less than cheesesteaks or scrapple. What was originally an inexpensive food offered by these bakeries to their respective Italian communities moved beyond these enclaves to be enjoyed and even baked by all Philadelphians so much so that in the twenty-first century many Philadelphians still sought out their favorite bakeries for their favorite slice (corner, middle, or side) of tomato pie. J.A. Reuscher is a reference librarian with the Pennsylvania State University Libraries. Anderson, Burton. Treasures of the Italian Table: Italy’s Celebrated Foods and the Artisans Who Made Them. New York: William Morrow and Company, Inc., 1994. Capuzzo, Jill P. “Trenton Tomato Pies are still a Staple of the New Jersey Pizza Scene.” New Jersey Monthly, January 12, 2010. Hyman, Clarissa. Cucina Siciliana: Authentic Recipes and Culinary Secrets from Sicily. New York: Interlink Books, 2002. Levine, Ed. Pizza: A Slice of Heaven, The Ultimate Guide and Companion. New York: Universe Publishing, 2005. Malloy, Chris. “Tomato Pie is a Philly Staple.” Boston Globe, January 21, 2014. Baker Street Bread Company, 8009 Germantown Avenue, Philadelphia. Cacia’s Bakery, 1526 West Ritner Street, Philadelphia. Gaeta’s Tomato Pies, 7616 Castor Avenue, Philadelphia. Iannelli’s Bakery, 1155 E Passyunk Avenue, Philadelphia. 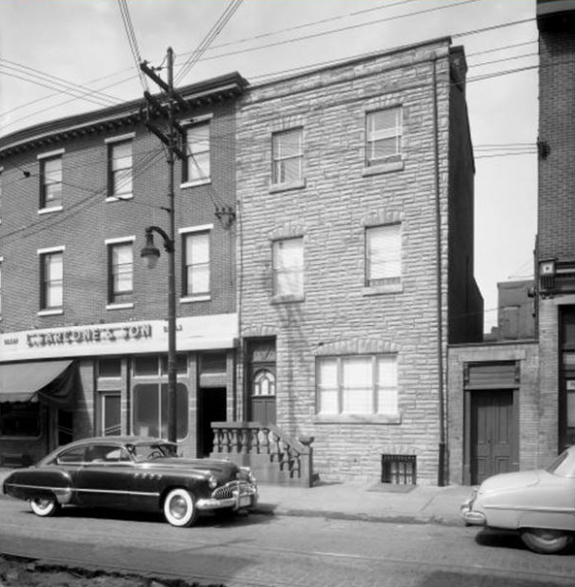 Marchiano’s Bakery, 4653 Umbria Street, Philadelphia. 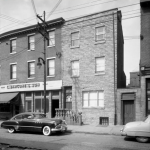 Sarcone’s Bakery, 758 S. Ninth Street, Philadelphia. Tacconelli’s Pizzeria, 2604 E. Somerset Street, Philadelphia. Tony Roni’s Pizza, 499 Domino Lane, Philadelphia. Thanks, I didn’t realize that tomato pie was a Philadelphia thing. That explains why Whole Foods here sells it. Similar pizza was available in bakeries in Boston when I was in school there in the 70s, also thick crusted and made in large rectangular sheets and sold by the square slice, but Boston bakery pizza always was topped with mozzarella. You’ve given me a craving and since I live on 9th Street in South Philly, I think I’ll stroll over to Sarcone’s Bakery for some. Buon appetito! Can’t forget about Corropolese tomato pie in Norristown! They are as good if not better than anything I ever had growing up in Philly. Ready this brought back great memories of growing up in South Philadelphia and all of the bakeries that I have bought tomato pie from. It also makes me a little sad to think of the bakeries that have closed and worried about the prospect of the tradition being lost if the current generation of bakers aren’t passing this along to those who would follow the traditional recipes. I hope they are and encourage anyone who hasn’t had one to try one! Wonderful article. Next time I am in Philly I will definitely try tomato pie. Well researched and written! Really want to try and make a tomato pie with the Palermo style recipe. Thank you for listing locations to try. My favorite or go to is Corropolese, but also enjoy other variations! Thank you again for sharing this research!! Look forward to reading any other food research you may have done. Where is the best place to find your work? ?